As you probably know, Microsoft Office 2007 has never been the main focus of our site. Even so, many of our visitors requested a guide on how to migrate their e-mail to Microsoft Office Outlook 2007. We are trying to listen, as much as possible, to what our readers ask, so we decided to create this guide in order to help them with this request. This was not an easy task as there are many scenarios to cover. This is why we limited the scope of this tutorial only on how to migrate your e-mail from Outlook Express, Windows Mail and other versions of Microsoft Office Outlook. If you are already using Microsoft Outlook 2003 or 2007 and you want to upgrade to Windows Vista and/or Microsoft Office Outlook 2007, then you should first create a backup. To do that, read our guide on how to backup your Outlook inbox. If you are using Windows 2000 or Windows XP and Outlook Express as your default e-mail client, the procedure is a bit complicated. That's because Outlook 2007 cannot import your e-mail from a backup folder. 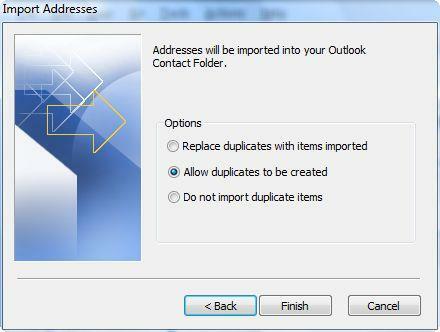 Outlook 2007 imports your e-mail only if it is installed on the same machine & operating system with Outlook Express. If you plan to migrate to Windows Vista and Outlook 2007, then you need to install Outlook 2007 on your Windows 2000/XP machine, migrate your e-mail and then create a backup from Outlook 2007. Only then you can install Windows Vista and Outlook 2007 and import your e-mail from the backup created in Windows 2000/XP. Another solution would be to create a backup of your Outlook Express e-mail, install Windows Vista, migrate everything to Windows Mail and then import it to Outlook 2007. First, you need to go to the File menu and click on Import and Export. The Import and Export Wizard will open. Depending on the e-mail client you are importing from, you will have different options. If you had Microsoft Office Outlook 2003 or 2007 installed and you have created a backup before migrating, select Import from another program or file. 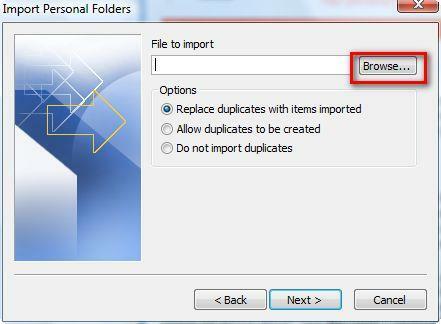 In the Import a File window, select Personal Folder File (.pst) and press Next. In the Import Personal Folders window, click on Browse. 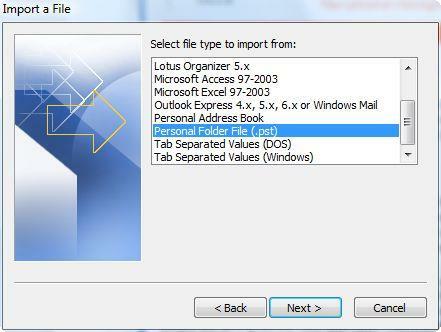 Navigate to the location where you have stored your e-mail backup, select the ".pst" file and press Open. Now, you will return to the Import Personal Folders window. Press Next and the importing procedure will start. 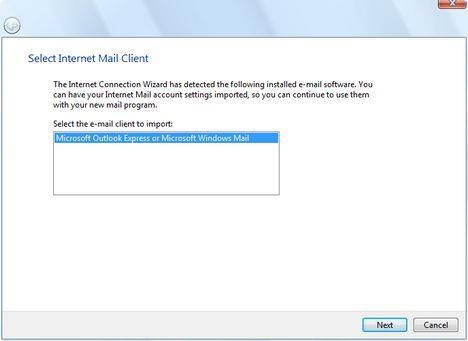 If you want to import your Outlook Express/Windows Mail backup to Outlook 2007, then select Import Internet Mail and Addresses. 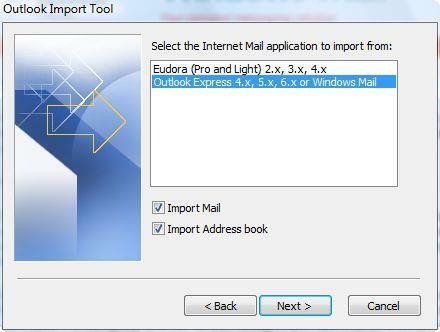 In the Outlook Import Tool window select Outlook Express 4.x, 5.x, 6.x or Windows Mail. Also, check the Import Mail and Import Address book boxes and press Next. In the Import Addresses window you can set how you want duplicates to be handled. Select the option you prefer and press Finish. The importing procedure will start and, depending on the size of your inbox, it may take from a few seconds to a few minutes to finish. After you have imported your e-mail, you should import your account settings. 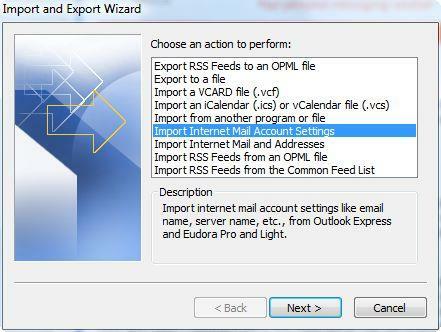 To do that, in the Import and Export Wizard window, select Import Internet Mail Account Settings and press Next. Now you will have to select the e-mail client you want to import from. Choose Microsoft Outlook Express or Microsoft Windows Mail and press Next. 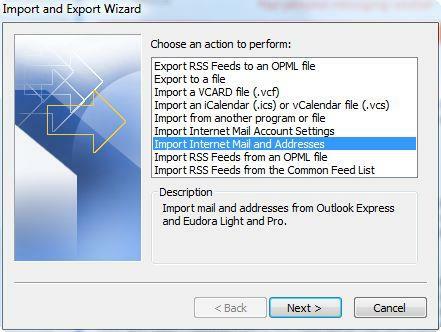 The wizard will show you a number of windows where it loads the settings found in Outlook Express or Windows Mail. Press Next until all the settings are imported to Microsoft Office Outlook 2007. Could Bill have made it anymore difficult? Thank you for showing the way. In fact it's MUCH MUCH easier. On the old machine, with Outlook closed, copy the pst file. Move it to a folder on the Vista machine on which you have read/write permissions. 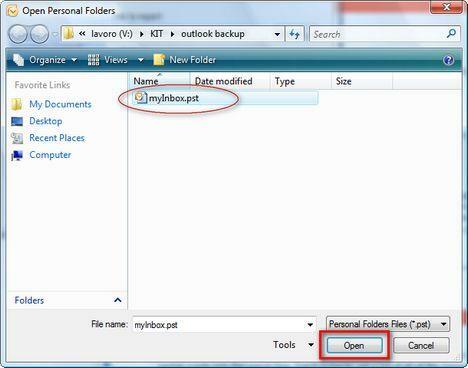 Open Outlook on Vista and do File-Open-Outlook Data File. Navigate to where you copied the file to. Thanks so much, Gordon. Your tip to use File>Open>Outlook Data File worked. Wish I'd read this post BEFORE migrating files from XP/Outlook 2003 to Vista / Outlook 2007 with Windows Easy Transfer. My experience was similar to those in other user groups: Although Outlook contacts appeared, they were not appropriately associated with an address book, and the the checkbox "Show contacts as an Outlook Address Book" was grayed-out and could not be checked. By the way, using "Import/Export" functionality DID NOT solve my problem. Since I'd already used my new machine for a few days, my data file had been augmented from that on the old machine, so I did not re-copy it. Instead, I worked soley with the Outlook 2007 data file. I copied it to my desktop, and deleted it from Outlooks default datafile location, deleted my user profile, created a new user profile, and then used File>Open>Outlook Data File from within Outlook to locate it. Ultimately, I moved the datafile back to the default location. Don't know if this was overkill, but my Contacts now function properly. i need a way to transfer my contacts to Outlook 2007 under windows 7. i tried what you did under Vista and did not succeed. . any other advices ? I do have the same problem: I have followed the same procedure; all mails are transferred, the number of them is marked, but when I open them the file is completely empty. I have improted the folders several times, but I get each time no result. Who can please help me out? I tried to import my backup outlook express to Vista (window mail) many.many time, I just fail to import. We will create a tutorial about this and publish it in a few days. Where is the wretched tutorial you promised in March 07 "in a few days" ????? Why is a migration requirement that is as obvious as the one from your basic email package Outlook Express to a more grown up Office Outlook so difficult and inadequately explained??? I have over 40 years IT experience. I spent a good deal of time thinking about and explaining migration scenarios to customers. But Microsoft? Can't be bothered to think about the problems it seems. Now I am trying to help a retired friend set up his new machine. If you would have the patience to read until the end of this article you would notice the fact that we placed a links towards related content like How to setup an e-mail account in Outlook 2007 or How to migrate to Outlook 2007 & Windows Vista. I would appreciate if you will change the tone next time you make a comment on our site. We are not responsible for your problems as we did not cause them. Also, we do keep our promises. If you would be willing to read what we write or search our site you would find the answers you seek. You can directly import your emails from windows Mail to Outlook2007 or first you can export messages from Windows Mail and make as (Personal File Folder.pst) then this folder can choosed in OutLook2007. Wish you solved your problems. 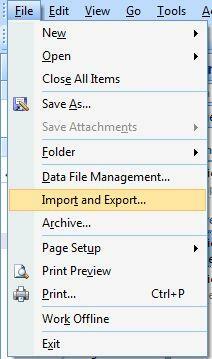 DO NOT USE THE IMPORT/EXPORT FUNCTION to move Outlook data from one Outlook to another. people to import a native file into Outlook. PLEASE remove all this stuff about using Import/Export - it caused people to lose data and is unneccesary. I've got an XP machine with Outlook 2003 and am trying to get the pst from there into my Vista machine with Outlook 2007. Importing didn't work, as you've stated. You say "Opening a PST file will preserve all of these" but how do I do that? Whether I try to just open it or try to Open With, I get the message pop up "The command line argument is not valid. Verify the switch you are using." I tried your suggestion in attempt to preserve views, forms etc. Everything worked except views. All my custom views created in Outlook 2003 were set to work on the specific folder however in outlook 2007 I only see the default views. Opening the PST only works if you are using the same version of .pst files. Outlook 2003 and 2007 share the same .pst style, versions before that (well i think as far back as 98 anyways) have a different encoding and therefore must be exported to a pst file and then imported. You may also have to select inbox and export that and then export your contacts. I am not an expert I just know that worked for me in an Office XP to Office 2007 migration. I have followed your steps by step on the import of outlook pst file to Vista computer but I was stopped at the "Import messages"- No messages can be found in this folder or another application is running that has the required vfiles open. Please select another folder to try closing applications that may have files open. I had use my colleague Microsoft XP computer which could easily open by clicking on the Achive file for the outlook pst file. Why is Vista program is not able tom open the outlook pst file on my Vista computer? I need your urgent advice as it is so difficult to fix this problem. The error message I get is "The file . . . is not compatible with this version of the personal folders information service. Contact your administrator". I am trying to migrate from Outlook 2002 on XP to Outlook 2002 on Vista. Works importing into Office 2007 on Windows XP but not on Vista. Gives me a message that the file is being used when I try to import it. Took all of 1 minute to import it onto the CEO's laptop which is Windows XP all I'm getting is the "moving" circle. Makes me insane. Trying to figure out and search for a solution takes up valuable billable hours to my clients. Some serious how to information would be helpful here. I am so confused now! I have Outlook 2007 and I have saved the .pst file on my XP. I got another new computer now and I have Vista x64 on it and I just install Outlook 2007 on it also. I have successfully imported the .pst file. The problem now is now I have two profiles. I cannot delete the other profile because I cannot sent email out. Thats why it has this profile. And I cannot delete this .pst file! I just cant get rid of it. My .pst file is my Default. So I now have 2 profiles in my Outlook 2007. Made the procedure to transfer easier with these steps. I have a different problem involving migrating from XP to Vista using Outlook 2007 on both machines. I have multiple accounts (I mean more than 100 different email-accounts on different servers and with different usernames/passords). Can anyone tell me an easy way to migrate the account settings (including all 100+ email accounts and all rules, signatures and stationery attached to those accounts)? Thanks for your help. PDA or smart phone may be a good solution here, at least it was for me. Used Blackberry to populate the new Outlook from the portable device with data from Outlook 2002. I had tried all the fixes in this thread. None had worked. The only obstacle I had to overcome was downloading and installing a new version of Blackberry desktop software whic was free from RIM. After that it was just like starting up a new Blackberry. I still can't migrate the PST files. Please, just read the 2nd post of this thread! Or do this. For all of you having problems migrating 2003 to 2007--please just read and do the 2nd post in this thread by Gordon Burgess-Parker. It works. This is the method I used before I stumbled upon this thread. Everything transferred over. All Outlook is looking for is the PST file. Just copy your old PST to your new directory for Outlook 2007 and open it. That's all! If you want to know where to copy your old PST file, go to Tools, Account Settings, click on the Data Files tab, and there is the directory. On Vista, it is probably C:\Users\***user ID***\AppData\Local\Microsoft\Outlook. Your PST file contains everything--email, calendar, contacts, notes, etc. If you've already received mail or added contacts, etc. to Outlook 2007 before you did this, make sure Outlook 2007 is closed, navigate to the above folder with the PST file, rename it to something like "OutlookOLD.pst," copy your Outlook 2003 file to this directory, open Outlook 2007, then import the renamed file. It will add your new emails, etc. Now if I can just find out how to work with these stupid new color categories I'll be happy. Hello, Im not real techy but I cant seem to find this specific scenerio. I have an XP machine with Outlook 2003 and I'm trying to move my emails to my new Vista machine with Outlook 07. I was able to import a portion of the data, but it is missing the date/time and other content. Any ideas? Well im doing that, exporting to outlook. I have a lot of mails, and transfer 40.000 mails, take me 23 hours!!! How can do that faster??? I don't think there is a fast way of transferring 40.00 e-mail messages. Do you really need them all? Isn't it easier to delete the old/non-relevant e-mails? You might end up with just a fraction of what you have now and the transfer would go much faster and smoother. My outlook 2007 send and receive time is not the same as the time of Windows 7. Exsamble. windows 7 time is 18h00 and I send a test mail from outlook 2007, the the time display in outlook for the mail send is 03h30. I upgraded from my old computer running XP Pro SP2 to Windows 7 with MS Office Outlook 2007 using Windows Easy Transfer. Now my contacts will not work with my emails. When I select a new email and then use TO: to find a contact, I have no addressbook and get the following error: "The search cannot be completed. You must have an address list to search in. If you don't have an address list then conact your Microsoft Exchange Adm."
I have selected Contacts: and then looked at the properties of a contact folder to see if the addressbook is attached to email and the selection is dimmed. I have not been able to attach my contacts folder to my emails, can you help? can you please guide me properly how do I import all my email form outlook2007 to yahoo mail. I want to bring all my outlook mail to yahoo mail. I upgraded my computer from VISTA to WINDOWS 7. In Windows Mail I used the export windows mail and contacts to a file. It was the only option that seemed to work. Now I need to import mail and contacts into Outlook 2007 and cannot. The workflow shown in this forum is not working for me. I do not have a pst file. Now what can I do?